"Insufficient Data!" - K-9, help or hindrance? Although Philip Hinchcliffe's tenure was highly regarded, it invited criticism from certain quarters for its supposed exaggerated horror content. 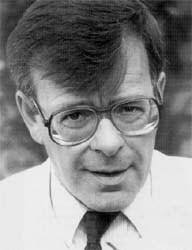 So when new Producer, Graham Williams, entered the frame in 1977 with Season Fifteen, it was with instructions to generally reduce the level of violence. This initiated a major change of direction. Whereas an occasional flippant remark had not broken the suspense, now the show was very much more light-hearted, giving many long-time viewers the opinion Williams had gone from one extreme to the other, instead of finding a suitable compromise. Into this new period came a new companion that would ensure compatibility with the hierarchy upstairs. 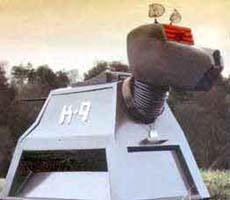 K-9, created from a sketch by Effects Designer Tony Harding, was introduced to us in that season's second story, The Invisible Enemy, as an intelligent computer dog, which is given to the Doctor by its owner/creator Professor Marius when they part company. During the stories which followed, the production team discovered that, both in front and behind the camera, there were advantages and disadvantages to the tin dog's existence. But was it more of a help or a hindrance? On the downside, the remote-control operated manoeuvrability of the machine was severely restricted, making the movements appear strained and ultimately inaccurate. In its earlier stories, the motorised noise of its operation all but drowned out the lines of the actors. Its speed, or rather lack of it, was another downfall. It never failed to garner a good-natured chuckle from me, when the Doctor said, "Lead the way, K-9." The metal mutt would go whirring slowly down the corridor, with the others shuffling almost on the spot behind it. When the camera switched to the passageway's far end, K-9 would be way out in front, the others hurrying to catch up! 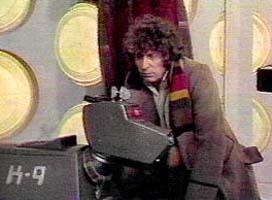 As with the Daleks, its main drawback was its lack of compatibility with altering terrain. Visual effects were often utilised to make it seem as though it was traversing rough ground, although they were not sufficiently professional to convince. K-9 moved very little outside of smooth-floored structures and, in the same way, it should never have been able to glide freely through the TARDIS doors when the jutting base of the police box required stepping over. It only needed to be lifted from the ground or pushed over on its side, to be rendered totally immobile. Its self-recharging powerpack proved unreliable at the best of times. It made the character vulnerable, but only when the plot of the current story demanded it. Similarly, the laser cutter took mere seconds or long minutes to burn through the same composite material door. 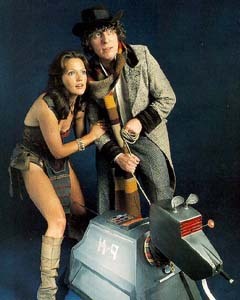 K-9 was sucked into the steadily increasing level of additional humour from both Graham Williams and Script Editors Anthony Read and Douglas Adams, so that when Tom Baker's Doctor went through a silly period, so too did K-9. The logical machine mind was at times reduced to exchanging ridiculous banter. I feel that the character would have been considerably more convincing had more thought been applied at the conceptual stage, and had they taken it more seriously. As it was, it was invariably utilised as a last pitch means of escape for the Doctor. During this period, the Doctor ceased thinking and simply blew a dog whistle instead. Perhaps the BBC should have immediately seized upon its popularity by producing K-9's own programme much earlier, and maybe aiming it at a younger audience. On the positive side, the character possessed many assets: It had a huge capacity for stored knowledge (which was never quite tested to its limit); equations and probabilities could be calculated to several decimal points; a print out of data could be produced upon request; it had the ability to scan and identify most objects; sensory equipment meant approaches could be detected; a retractable laser cutting tool was also used for defence; and combining these together, it could be dispatched to complete a complicated task without supervision. However, what made K-9 so loveable to so many people was its characterisation. Yes, it was possible for what amounted to a robot dog to possess a character, and this should be accredited to John Leeson's proficient voice overs. A hunk of electrical machinery should not have developed as a character either, but it did. In its first story, K-9 sputtered out ticker-tape strips and rarely spoke. Further on, it replied to only direct questions, answering in an emotionless, machinelike manner, constantly confusing the Doctor's companion Leela. When K-9 elected to remain with the Sevateem warrior on Gallifrey at the end of the season, the Doctor cannily revealed a K-9 Mk II (one he made earlier!). This one was much less introverted; I would even venture to say it was a veritable chatterbox. It had gained a sense of humour, and even exchanged banter at the height of danger. Sometimes K-9 was left behind in the TARDIS, and this meant that when certain information was required, or they needed to be released from a scrape, it was present as a resourceful back-up. 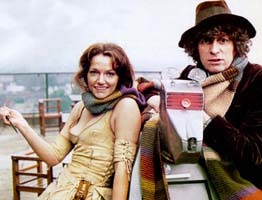 As a regular companion, it was loyal and faithful, and defended the Doctor and new companion Romana by any means necessary, even if its own existence was in peril. This new semi-regular inclusion into Doctor Who proved very successful, generating widespread newspaper publicity. There is no doubt that it increased the viewing figures, at least initially, and raised the numbers of younger children watching the programme. This was proved by the storm of protest and the 'Save K-9 Campaign' initiated when it was rested from certain stories. 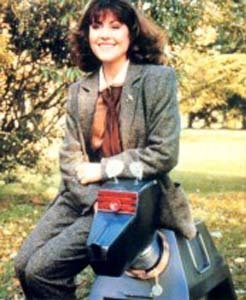 The 1981 K-9 and Company the spin-off pilot (titled A Girl's Best Friend), in which Sarah Jane Smith received a K-9 Mk III from the Doctor, was a competent 50-minute script from the pen of Terence Dudley. However, although the BBC regional transmitter fault undoubtedly affected viewing audiences, the BBC had already missed the boat. The popularity of K-9 had waned. Seventeen years later, there was a current attempt to revamp the concept for its own series aimed at a younger, preteen audience. 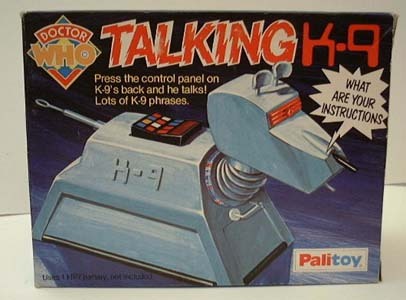 Produced by Paul Tams and Bob Baker, the latter of which along with Dave Martin were the original scriptwriters for the character, much rested on the success or otherwise of a new futuristic version of K-9 which was built and the quality of reworked scripts. Although the project is still said to be on the cards I remain pessimistic the idea will work twice, being essentially too restrictive. K-9 has had its day but, like it or loathe it, during those changeable three years it was impossible to ignore. Personally, I couldn't abide the thing!